Former CIA Director David Petraeus gave closed door briefings to Congress today that focused on not on his affair or his resignation, but on the Sept. 11 attack on the U.S. consulate in Benghazi, Libya, and when exactly U.S. officials knew there were terrorist elements involved. After the hearing, Democrats and Republicans disputed whether Petraeus has been consistent in his testimony, and whether the CIA talking points on the attack were altered. One Republican, House Intelligence Committee member Peter King, told reporters that the original CIA talking points regarding the attack clearly attributed the incident to al Qaeda affiliates, but that the talking points were changed after being vetted by several agencies, including the Justice Department and State Department. "No one knows yet exactly who came up with the final talking points," King said. "The original talking points prepared by the CIA were different than the final ones put out," King continued. Originally, he said, they were "much more specific on al Qaeda involvement." Later Friday, the White House denied making any move to censor any mention of terrorism in Rice's Benghazi talking points. "The talking points about the intelligence assessment that Susan used were produced by the Intelligence Community," National Security Council spokesman Tommy Vietor said in a statement. "The White House and State Department offered one edit, changing consulate to 'diplomatic facility' for accuracy." Petraeus told lawmakers today that he consistently told Congress that there were terrorist elements involved in the attack, which led to the death of U.S. Ambassador to Libya Chris Stevens and three other Americans. King, however, said he remembers Petraeus' Sept. 14 testimony differently. "I told him... I had a very different recollection of that," King said. Rep. Dutch Ruppersberger, D-Md., didn't agree with King's recollection of the Sept. 14 briefing. Ruppersberger told reporters after the hearing, "My recollection was ... [Petraeus said] it was the result of the protest... but he also said in the group there were some extremists and some where al Qaeda affiliates." Sen. Kent Conrad, D-N.D., "Gen. Petraeus as director of the CIA has been completely consistent." Conrad, a member of the Senate Intelligence Committee, said that much of the confusion is due to the difference between classified and unclassified information. "When people are talking in a classified setting, they can say much more than they can say in an unclassified setting," Conrad said. The CIA talking points are a source of controversy because U.N. Ambassador Susan Rice used them to describe the nature of the attack on CBS' "Face the Nation" and other shows on Sept. 16. Republicans have attacked Rice, who is considered a possible nominee to replace Hillary Clinton as secretary of state, for suggesting the attack was the result of spontaneous protests. CBS News obtained the CIA talking points given both to Rice and members of the House intelligence committee on Sept. 15, and they make no specific reference to "terrorism" being a likely factor in the assault. However, they did indicate that "extremists participated in the violent demonstrations." Conrad said Rice "did completely the appropriate thing." "She used the unclassified talking points that were signed off on by the entire intelligence community," Conrad said. "There are other things that are classified. That's a totally different subject." Sen. Saxby Chambliss, R-Ga., said Rice "went beyond" the talking points. "She even mentioned under the leadership of Barack Obama we had decimated al Qaeda," he said. "She knew at that point in time al Qaeda was likely very responsible in part or in whole for the death of Ambassador Stevens." Chambliss, like King, said "there were some changes made to those talking points... There are still issues with those talking points that have to be resolved." Sen. John McCain, R-Ariz., said that Rice had access to classified information that indicated the story she was told wasn't accurate. "She should not have gone out and stated with certainty that this seemed to be a spontaneous attack," McCain said, CBS News correspondent Sharyl Attkisson reports. McCain said he asked Petraeus when he first talked to President Obama about Benghazi, and Petraeus responded, "I didn't." McCain said he was dumbfounded and pressed Petraeus, who told him he "never" spoke to the president about Benghazi and dealt with the Director of National Intelligence. "If I were president, and clearly I am not, I certainly would want to talk to the whole national security team, and one of the key members is the CIA whose personnel were killed," he said. CBS News correspondent Margaret Brennan reports that Secretary of State Hillary Clinton spoke with Petraeus shortly after the Benghazi attack began. 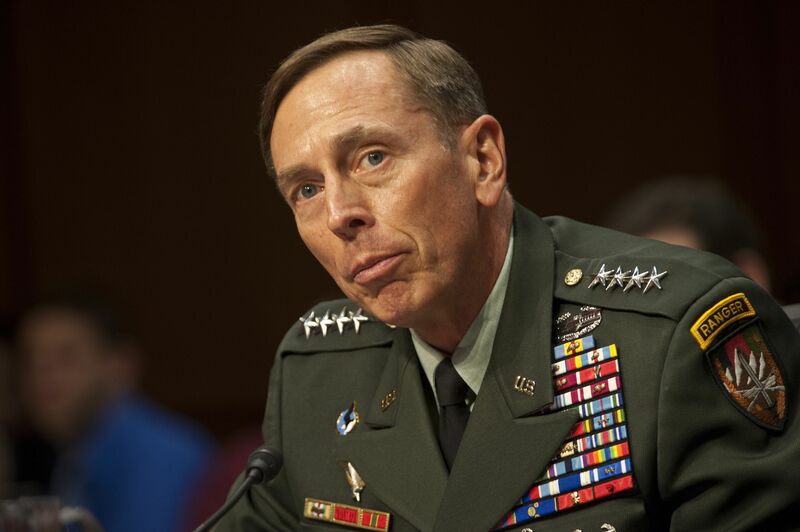 King said the House hearing was "cordial" and that Petraeus' recent resignation, prompted by his extramarital affair with his biographer Paula Broadwell, was only briefly addressed at the beginning of the hearing. It was "made clear at the start that would not be the focus of the questioning," King said. Rep. Jim Langevin, D-R.I., added, "The only thing he did in the beginning of his testimony is he did express deep regret to the committee for the circumstances for his depature" and reassure the committee that the Libya attacks had nothing to do with his resignation.